BVN gives each Bank customer a unique identity across the Nigerian Banking industry that can be used for easy identification and verification at Point of Banking operations. 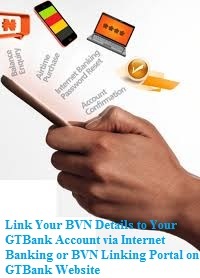 You can now link your Bank Verification Number details from another Nigerian bank to your GTBank Account via Internet Banking or BVN Linking Portal on GTBank Website without having to visit the bank. Important Things You Need To Know About Bank Verification Number (BVN) and Reasons Why you Should Register for BVN. To link your Bank Verification Number details from another Nigerian bank to your GTBank Account via Internet Banking, follow the procedures outlined below. Visit www.gtbank.com/bvnlinking to link your BVN. Already registered your Bank Verification Number details from any Nigerian bank and you have misplaced the number, due to one thing or the other, you have nothing to worry about. Read how to Check Your Bank Verification Number (BVN) with Your Mobile Phone, any type of phone and any network.